I recently paid a visit to Alvechurch Library in order to meet a sewing group who meet there on Mondays, because I heard that they were busy being creative, hand-making gorgeous gifts for a Christmas Eco Sale. The sewing group were great, and more of them later. . . I am shocked to say that I have not visited Alvechurch Library since they moved to their new premises next to the Middle School. When I was growing up I used to visit my local library regularly – a monolithic Victorian pile which doubled up as a museum on its first floor, with large dark portraits of heavily-bearded city elders in ornate gold frames hanging on the walls. The experience was certainly enjoyable but tinged with fear in case we were “shushed” by the librarian, forgot our tickets or slipped on the cold floor tiles. The library was not a place for chatting, having fun or doing anything apart from silently tiptoeing around, selecting a book, proffering the ticket and leaving via a long flight of stone steps. I know this sounds like something out of Dickens but it is not so long ago – and how things have changed! For a start, at Alvechurch Library the librarians are vivacious, welcoming and enthusiastic about their place of work and what they have to offer. Then there is the warm, bright space with its pervasive and delicious smell of coffee, which emanates from a real coffee machine where visitors can buy a coffee while they enjoy dipping into a book or taking part in a class. This is a place where visitors are welcomed, helped, supported and encouraged – not just to read books and listen to story or music CDs, but to join groups of others who want to learn and make things, or work towards a shared goal. The friendly sewing group told me that they had formed in spring this year and their numbers have been steadily increasing as word has got round; there are 16 members now and eight ladies on the day of my visit. The class runs from 11am–12 noon every Monday and group members share materials, ideas and equipment. Shirley Nutt, a keen needlewoman, was constructing a pretty frilled child’s apron from donated fabrics for the upcoming Eco Sale, and also showed me a beautiful appliquéd child’s cot blanket she had just completed. Hazel Herrin was knitting a delightful cot blanket in textured squares, while Rona Dalley – who was born and bred in Alvechurch – was having a rest from making Christmas boxes and was busy finishing off an Alpaca cardigan. Chris Lucas was covering pots with gold ready for Christmas decorations. 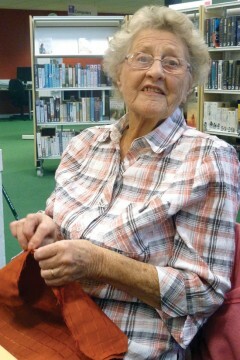 Chris Robinson has only lived in Alve-church for a year and has found the group a good way of making friends; she was making red felt hearts as tree decorations and has already prepared bunting and other decorations. Mary Lewis (pictured above), who has years of sewing under her belt, was putting together a peg bag while Denise Bassett was fitting a ballgown on a tailor’s dummy – made from her own design. Lastly, Lynda Webb was knitting one of those pretty lacy scarves that look really complicated but are, apparently, quite easy. So apart from the sewing class, Alvechurch Library is also offering the Eco Family Christmas event on December 7, a visit from the Country Market on December 10 and, for children, a Christmas Bedtime Story Telling session on December 23 where a certain man in a red suit is rumoured to be visiting! I felt as though I had barely scratched the surface of all that was on offer at Alvechurch Library but it made me want to return there. How extraordinary the change in libraries has been in the last half century. While on the subject of libraries, we recently went to visit the new library in Birmingham. During its time of construction I had felt quite negative about it and remember complaining that it looked like an over-decorated birthday cake. But having visited, I feel quite differently. When Selfridges opened their gorgeous aluminium-clad curvy shop in 2003 it felt like the city had arrived in the 21st century with its very own iconic landmark building. Approaching and entering the new Library was just as exciting and made me realise that this is equally important for Birmingham, or more so – a real tourist destination as well as a place to research and study. I loved the plantings on the roof and mid-height balcony, the glass lift, numerous gadgets, coffee shops and 60s-style pod seats. This is definitely a place to include in a tour of Birmingham, maybe over Christmas or the New Year with your guests. The view from the roof top of the whole city is staggering – it makes one proud to live near Brum! Have a great Christmas, and best wishes for 2014.